Thanks. The riots have not been covered well by the main stream media in the US. In fact they were ignored for several weeks. I picked the wrong date because it was the earliest reference I found in US outlets. why don't you post a separate thread on the grand cross of april 2014? i am curious to hear what you have to say about it... thanks..
i believe that nic campion was a result of his time... mundane astrology prior to the reintroduction of the older texts translated by project hindsight and etc - involved charts for countries which typically had a number of important dates to consider... one can say they all have some relevance and bearing..
the charts that tom posted are a reflection of how astrology was done previously to the 20th century up until sometime into the 1990's... i haven't commented on the charts tom posted, but i believe they have a lot of merit too.. the problem with them is the charts for france, uk, germany and a number of other countries along a similar longitude line have much in common.. when you are using one of them to reference france for example, you are also picking up very similar influences on a country like norway for example... it makes the use of aries ingress charts problematic as i see it.. The methods I referred to are those of Jean Baptiste Morin deVillefranche (1583-1656) as taught in his text Astrologia Gallica published posthumously in 1661. He did not always follow other traditional astrologers. Most mundane astrology prior to 17th century France comes from medieval "Arab" astrologers. An excellent source for those methods is anything written and/or translated by Ben Dykes that covers this topic. Like all other branches of astrology, there is no one set way to do it. I stick with Morinus for two reasons: 1) he makes a great deal of sense to me, and 2) it isn't possible to follow all, most, or even several of them without getting muddled. Very roughly speaking prior to the arbitrarily chosen year of 1951, the Aries Ingress was used for mundane prediction. However a large number of European astrologers, using the 1939 Aries Ingress, predicted "No War." Well, that didn't turn out too well. In 1951, C.E.O. Carter published a wildly influential little book titled "Introduction to Political Astrology" wherein he blamed the technique of the Aries Ingress for the astrologer's failure in 1939, and recommended national charts and the use of planetary cycles for mundane prediction. Those are the most popular methods today for broad prediction. I can't say they are any more accurate than the missed WWII predictions - look at the US Presidential election for 2016 for example. That looked like a replay of the 1939 European predictions, and possibly for the same reasons. This is not to say Carter was 100% wrong and his recommended methods have no value. To say that might be worse than getting the predictions wrong. I will say I'm not persuaded they are an improvement, but that's me. Ironically Morin addressed these issues in mid 17th century. He said that national charts would be great if we could determine with certainty when a nation began. And all we have to do is look at the number of charts proposed for the USA as an example of how that works out. He also argued that the Saturn-Jupiter conjunctions would be wonderful, too, if they could be calculated accurately. They couldn't in his day, but they can be now. He pooh poohed the use of mean conjunctions as recommended by Abu Mashar in the 8th century. Whether or not he is correct is a different topic. I'm only laying out some history in an effort to put things into perspective. There is usually more than one way to the truth so all methods that work reasonably well and better are fine. There probably isn't just one good method. What I like to see, and what I like isn't way up there on the importance list, is that people use the methods they prefer, and just tell us what they're doing and why and how that applies to their predictions and understandings. We all benefit that way. And BTW I found that you got smth interesting here (my commentary on the Tuilerie palace/gardens in 1792/ Nov 2018). That's what I thought: that since you are considering lunations, you might be interested in a more accurate chronology. I'm glad it was useful. If you ever want any further information, you're always welcome, Tom. P.S. Well, yes, I think it's enriching to consider the same events with all the instruments we have in our possession and cross the findings. Anyway, I think that this extensive use of many methods and many charts and the way the process unfolds within different frames is quite essential to the mundane astrology. i had thought to share how i would include these in relation to the aries ingress charts.. from my reading of dykes translated books, it is my understanding that one can consider the aries ingress charts, especially closer to the 2020 conjunction and put them together in some way... i have done this before, but haven't done this on this thread... i might try getting round to this, but as someone else - might have been tom - mentioned this - the difference between france and britian is not a lot in terms of the aries ingress charts.. The sign on the Libra Ingress MC, Taurus, is now on the New Moon ASC in Paris. The rulers of this chart are Mars and Saturn. They each rule an angle and Saturn rules the following angle (the angle that follows in the order of the signs, the principle point, the point of the New Moon), and they are in a mixed mutual reception. The malefic planets dominating at the Primordial Point and badly disposed presage some evils. They will be more grave if the said planets occupy or govern the angles of the figure, and extremely grave if they are determined to evil by the places that they occupy or govern for example if they are in the 4th, 6th, 7th, 8th or 12th house. In the Aries Ingress prior to WWII Neither Mars nor Saturn were "badly disposed" in that both had great dignity in Capricorn. What I'm thinking, if I might be allowed a bit of mind reading, is that the description above is a worst case scenario and even if Mars and Saturn are OK by position, but the rest of the conditions are met, things will still get bad. And to be fair we are now talking about rioting, not a world war. I'll still give him an "A" for prescience. Yes this is hindsight astrology, but I think it is fair to say that with a cursory knowledge of contemporary French politics, an astrologer might predict difficulties to say the least, and if someone was really familiar with the situation in France, rioting would not be out of the question given the lunation's position on the south scale. The 2020 conjunction in December is the first conjunction in a series that occur in air signs. The May 2000 conjunction is the last in earth. This next is called a mutation conjunction and indicates a significant shift world wide. Keep in mind the events indicated by these conjunctions unfold slowly. Don't expect something big in December of that year. I don't use Pluto much in natal astrology, but I think it has significant value in mundane astrology because it moves so slow. here is the overlay of 2018 libra ingress with 2020 conjunction on outer wheel..
BTW, speaking of the 7 Nov New Moon (15°10' Sco). Do you know what I just spotted when looking at the 5th Rep chart? (can be any Sep/Oct 1958 chart). The previous eclipse was a partial lunar eclipse in May 1958 at 12°33' Sco. Also, Tau is on MC and Sco on IC (the king vs the people). Which is the Asc-Dsc axis of the New Moon (although the degrees themselves fall into 9/3, may be meaningful with the respect of the organisation and the role of social networks?). And guess where was the lord of the eclipse? It was in Pisces (like now) and angular setting on the DSC. 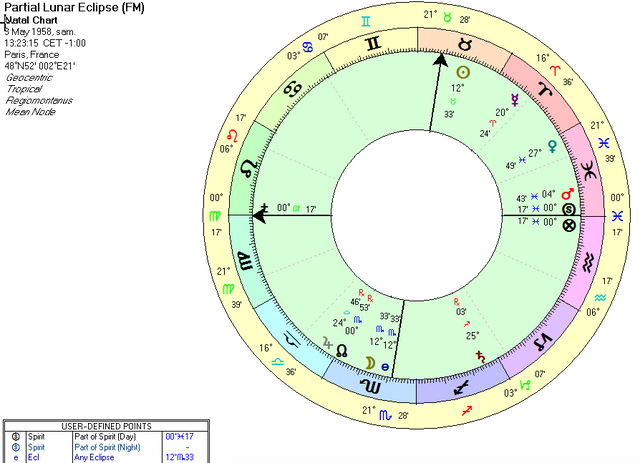 Now the lord of the new moon (7 Nov) made its ingress into Pisces on 16 Nov 2018. It transited the 1958 Mars on 24/11 when protesters first organised their event in Paris and surprised everyone by gathering on the Champs-Elysées (normally there are no protests allowed there, NEVER), also there were the first damages in Paris that night. There is a call for a bank run by the yellow vests in France which want to impose the Iceland style referendum instituted at the time of the "pots and pans" protest of 2008. It is scheduled to happen on January 12th. Many in the bitcoin / crypto community are keeping an eye on this development. It seems to be a reincarnation of the #Occupy movement. When Macron was elected in the Spring of 2017 I found it somewhat startling that Tr. Saturn was then in Sagittarius so close to entering his 12th house. For a political leader who needs to show "results" to a demanding electorate and other international leaders do you really want Saturn in your 12th during your term of office? Well, here we are and Tr. Saturn is in his 12th and Macron seems to be floundering. The upcoming Saturn-Pluto conjunction will be firmly in the 12th as well; and Saturn rules his ASC, Pluto rules his MC. Is it possible that he will be forced to resign within the next year? curtis -- what happened with the bitcoin bank run? nothing? dean - thanks for drawing that to my attention... i went and looked at macrons chart last night after you mentioned this.. below is his chart..
he has a sun/mercury in the 12th sign to his cap ascendant.. his presidency chart is essentially a saturn transit to his sun - 12th house sun... there are an unusual number of 12th house saturn types that have made it to the usa presidency... i don't have a number, but both bush junior and trump have saturn in the 12th sign to their leo ascendant.. maybe saturn in the 12th is about service to the community and it is a good place for it, as opposed to thinking it is all a negative? i am just speculating here..
i would say with macron, i have a hard time reading this astro chart!~ having mars and saturn over in the relationship sphere of his chart - 7th and 8th house, doesn't seem especially attractive.. he is married to an older women as about as much as i know about him on this level and the fact he has managed to really alienate a large number of french people after having been elected... it seems like macron has some powerful and influencial friends and connections and that more then anything, with the exception of his pretty boy face, which apparently was enough to convince the french folks to vote for him.. what does that say about the french voting public? lol... i see this as the pluto conjunct libra north node and up in the 10th sign area..
he has an out of sign opposition to jupiter in cancer retro... the quck analysis on this is that if i read it as an 8th sign to his sun - he is wealthy, even if jupiter is retro and out of sect..
addendum... relevant quote i just read which i am adding to all this..
"I'm sure you notice that the gilets jaunes protests which is now in the 10th week are not reported at all at least in US media. If such protests were taking place in Russia, Syria, Venezuela or any place the Borg deems "enemies" there would have been non-stop hysteria on CNN, Fox, NBC, NY Times and WaPo." Well I don't think the majority of the population of France is going into crypto at the moment. As for the bank run, it's unlikely that you will get anything out of the established msm narrative other than that "everything is OK", until of course it isn't OK and it's obvious because they can no longer hide the fact. For now it seems, that the banking system is still intact. Luke Rudkowski (https://wearechange.org) has said that there have been reports of ATM outages. We should watch this weekend in particular. Rumor is that the gendarme's are stepping it up to live ammo and chemical weapons that can spread 6 blocks in a matter of seconds. Maybe this is just to scare protesters away, but nothing has worked to bring down the size of the crowds so far and they seem to be getting desperate.